It’s time to say farewell to Clementine. Please note that since each episode of The Walking Dead — The Final Season features the same graphics engine and control setup, those elements will not be repeated in our reviews for the final three episodes. To read our complete thoughts on that, refer to our review of Episode 1, Done Running. The Walking Dead‘s final episode, Take Us Back, is also the swansong for TellTale Games. Appropriately, it captures the best of everything the company has done since its dramatic shift from point-and-click adventure games such as Sam & Mac to interactive narratives. The writing is peak quality and the voice acting is outstanding; the strategic use of Quick Time Events (QTEs) — and handicapping them to make them difficult or even impossible — provides a visceral and authentic touch. But what about the story? Well, it’s really hard to talk about it without going into spoilers. 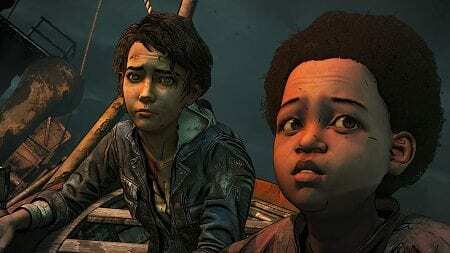 The main thing to know is that the episode focuses on the relationship between Clementine and AJ, and in doing so, some minor subplots kind of disappear. That being said, there is all sorts of emotional payoff throughout this relatively short episode (probably about two hours of playtime). It should also be noted that there are a handful of action sequences, and the lack of technical finesse here is notable. There were a few sequences that we had to play multiple times simply because the targeting cursor moved with a weird floatiness. Other times, the game wasn’t registering our inputs fast enough. And as much of the episode takes place at night, it was sometimes simply visually difficult to figure out what needed to be done in short periods of time (and under duress). All of those technical blips can be set aside, however, in favour of the big question: is it a good ending? The problem is that this episode comes loaded with expectations — from the past seasons, from the comic books, and from the TV show. As someone who has dove into all versions of The Walking Dead, we found the ending very satisfying, and we think most people will too. There will, of course, be people who complain about it, but it ultimately feels like this nails the fine balance between emotional truth and fan service (in a good way), all while running the complete gamut of feelings and stakes. We’ve been through hell with Clementine, but in the end, we think the series — and the company — has earned its rest, as well as its legacy in video game history. An emotional sendoff to Clementine and the series, Take Us Back pulls no punches but never feels indulgent or exploitative. Instead, it provides a deep dive into the parent-child relationship in the most impossible of circumstances — and for most players, it sticks the landing. The episode does continue the deep dive into Assassin lore as you work with Darius to take down a new chain of cultists, all leading to a confrontation with a group known as The Tempest. As The Tempest is an enemy based on water, there’s a bit of sailing going on in this episode.